Nitrogen (N) is the most important mineral nutrient required by plants. Although some plants can directly utilize N, ammonium (NH4+) and nitrate (NO3-) are the only forms of N that are usable to most plants. Ammonia-oxidizing bacteria (AOB) and ammonia-oxidizing archaea (AOA) are the key drivers that are responsible for the conversion of N into usable forms. Due to the importance of ammonia oxidizers (AOs), factors affecting their abundance and activity have been a major research focus over the years. This review focuses on the diversity of AOs, the factors that affect their abundance and activity in different soil types and the mechanism of nitrification. An improved understanding of the combinatorial effects of highly active AOs and methods for limiting nitrate loss from soils may enhance the management of nitrate in soils and improve plant yields. Ammonia occurs naturally in the environment and can be found in the soil, where it is an important source of nitrogen for plants. Ammonium does not typically accumulate in soils because it is quickly converted by soil microbes. Ammonia and ammonium are primary energy substrates and are important nitrogen sources for microorganisms in the soil (Daebeler et al., 2014). The oxidation of ammonia or ammonium by organisms is known as nitrification, and microorganisms that are associated with the rhizosphere of plants thrive in the phyllosphere. These organisms live inside the plants as endophytes, on the plant surfaces as epiphytes and in soils surrounding the roots. They can be beneficial, harmful or detrimental to the growth and development of plants. However, it is noteworthy that most of the different plant-colonizing microorganisms follow a commensal lifestyle (Knief, 2014). Soil microorganisms are the greatest contributors to the diversity of terrestrial ecosystems and are the major controllers of almost all global biogeochemical cycles. They are essential in the maintenance of plant health through their nutrient cycling roles and relationships with other organisms (Hassan et al., 2015). 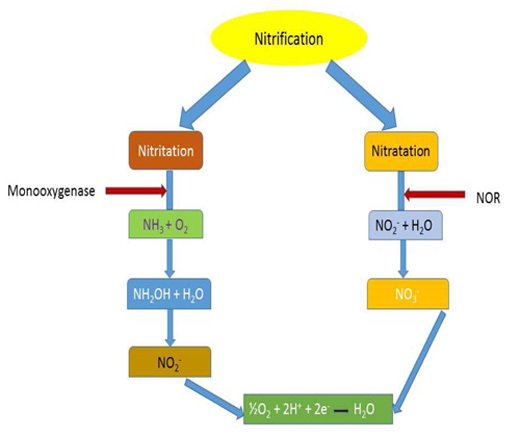 Nitrification describes the oxidation of ammonium (NH4+) or ammonia (NH3) to nitrate by living organisms and is a primary activity within the nitrogen (N) cycle. The oxidation of ammonium to nitrate is a two-step process involving the transformation of ammonia or ammonium to nitrite and the conversion of nitrite to nitrate. The first and rate limiting step of nitrification is the oxidation of ammonia to nitrite. It was believed that this process was solely controlled by ammonia-oxidizing bacteria (AOB), which were first isolated in the 19th century (Prosser and Nicol, 2012). The recent discovery of ammonia-oxidizing archaea has challenged this notion (Könneke et al., 2005). In the first step of nitrification, ammonia is converted into hydroxylamine by the enzyme ammonia monooxygenase. Hydroxylamine is then converted to nitrite by the enzyme hydroxylamine oxidoreductase. Nitrite-oxidizing bacteria that produce the enzyme nitrite oxidoreductase aid in the conversion of nitrite to nitrate (Kowalchuk and Stephen, 2001). Leininger et al. (2006) reported that ammonia-oxidizing archaea (AOA) were more abundant than ammonia-oxidizing bacteria in different European soils. This was the first study that revealed the importance of AOA in ammonia oxidation, and various studies have shown the importance of AOA in soil ammonia oxidation in recent years. The importance of nitrogen to plants cannot be overemphasized. It is the most essential nutrient required by plants as it is a component of nucleic acids, which make up the DNA of all organisms. It is also a component of chlorophyll which is used for photosynthesis. It greatly controls the output of fields, the pattern of growth of plants and their chemical composition (Crawford, 1995, Lobos Ortega et al., 2016, Wu et al., 2016). Not all plants are able to directly use atmospheric nitrogen, and most are only able to use inorganic forms of nitrogen, such as ammonium and nitrate. Although it is only transiently present in the soil, nitrate is a crucial form of nitrogen that can be assimilated by plants (Crawford, 1995). The oxidation of ammonia by microbes is of great importance because ammonia oxidizers are responsible for the production of approximately 10 kg N/ha of nitrate, which is approximately 90% of the yearly supply of fixed nitrogen (Smith et al., 1998). The function of ammonia-oxidizing microbes cannot be overstated in soils. This review focuses on the factors affecting the abundance and activity of ammonia-oxidizing microbes and discusses the importance of ammonia-oxidizing microbes in nitrification in different soil types. Nitrification in the soil is controlled by autotrophic nitrifying microorganisms (archaeal and bacterial ammonia-oxidizers) (Prosser and Nicol, 2012). The oxidation of ammonia/ammonium by autotrophic microorganisms is a two-step process involving the transformation of ammonium by ammonia monooxygenase to hydroxylamine (NH2OH), which is subsequently converted to NO2- by hydroxylamine oxidoreductase (De Boer and Kowalchuk, 2001). Chemolithoautotrophic nitrification is limited to a comparatively narrow group of microorganisms (Head et al., 1993). Ammonia monooxygenase (amo) is the primary enzyme responsible for chemolithoautotrophic nitrification. Ammonia monooxygenase is a membrane-bound enzyme that has three subunits, amoA, amoB and amoC (Sayavedra-Soto et al., 1998). The amoA gene, which is a metabolic hallmark of autotrophic nitrifying microorganisms, has been used as a molecular proxy in environmental microbiology (Stahl and de la Torre, 2012). The occurrence of nitrification in soils with a low pH has been argued to be indicative of heterotrophic nitrification (Zhang et al., 2015). Nevertheless, De Boer and Kowalchuk (2001)reported that acid-tolerant autotrophic nitrifiers could also play such roles. Both organic and inorganic substrates can be utilized by heterotrophic nitrifiers. The actual indicators of heterotrophic nitrification may have been misunderstood, since some heterotrophic nitrifiers also have denitrifying abilities and accumulate little or no nitrate (Matheson et al., 2003). Stutzer and Hartleb (1896)investigated and gave an account of a fungus that had the ability to produce nitrate. Many additional heterotrophic organisms have been subsequently implicated in the oxidation of different nitrogen compounds in culture (Schimel et al., 1984). Different studies have shown the importance of heterotrophic nitrification. Nitrification by heterotrophs differs strikingly from autotrophic nitrification because it is not associated with cellular growth (Zhang et al., 2015). Numerous microorganisms including bacteria, archaea and even fungi have ammonia-oxidizing abilities. AOB are widely distributed in the soil. The conversion of ammonia to nitrite, which is the first and rate-limiting step of nitrification, is controlled by chemolithoautotrophic AOB, and these organisms have the ability to make effective use of this process as their sole energy source (Matsuno et al., 2013). Various bacteria have been reported as ammonia oxidizers, including Nitrosomonas, Nitrosospira (Shen et al., 2012)and Nitrosococcus (Teske et al., 1994). The genera Nitrosomonas and Nitrosospira are members of a monophyletic group in the β-subdivision of the Proteobacteria (Matsuno et al., 2013). The genus Nitrosococcus belongs to the γ-subdivision of the Proteobacteria and members of this genus only oxidize ammonia in marine environments (Teske et al., 1994). Paracoccus denitrificans, Pseudomonas putida, Thiosphaera pantotropha and Alcaligenes faecalis are heterotrophic nitrifying bacteria (Crovadore et al., 2015, Van Niel et al., 1992). The presence of the amoA gene in uncultivated species Crenarchaeotawas revealed through complementary metagenomic studies of seawater (Venter et al., 2004) and soil (Treusch et al., 2005). Nitrosopumilus maritimus, which was isolated from the rocky substratum of a tropical marine aquarium tank, was the first AOA identified. It is the first identified archaeal chemolithoautotrophic nitrifier and the first mesophile identified in the marine group I Crenarchaeota (Könneke et al., 2005). AOA are members of a novel phylum Thaumarchaeota (Auyeung et al., 2015). They were first identified as members of Crenarchaea (Brochier-Armanet et al., 2008). Other archaeal nitrifiers include Candidatus Nitrosocaldus yellowstonii, Cenarchaeum symbiosum and Candidatus Nitrososphaera gargensis (De la Torre et al., 2008). Nitrification was believed to have only been brought about by bacteria and archaea. However, some fungi including Aspergillus flavus, Penicillium and Absidia cylindrospora, have been implicated in this process (Zhu et al., 2015). Nitrification is divided into two processes, nitritation and nitratation. Nitritation is the first step of nitrification and can be divided into three steps: (1) the oxidation of ammonia into hydroxylamine which takes place with the aid of the enzyme ammonia monooxygenase (amo); (2) the reduction of hydroxylamine into nitrite; and (3) the conversion of electrons, free hydrogen ions and oxygen into water. Nitritation results in the acidification of the environment. The diversity of soil microorganisms is extremely large and the structure, growth and activity of the microbial communities in soils can be assessed by biotic and abiotic factors. In different soil systems, the modulation of environmental factors causes changes in the communities of ammonia-oxidizing microbes (Shen et al., 2012). Various factors, such as changes in land use, the deposition of acids and fire, significantly influence the pH of soils. Microbial communities, and the biogeochemical cycles which they mediate, are significantly affected by soil pH. Fungi thrive more than bacteria in soils with low pH, and the soil pH greatly influences bacterial diversity and community structure. Past studies have shown that the community structure of ammonia-oxidizing microbes is highly influenced by pH (Zhang et al., 2012). Thus, soil pH is an indicator of the relative abundance of the ammonia-oxidizing microorganisms present in soils, the only soil property with the ability to do so (Prosser and Nicol, 2012). The soil pH is low for approximately 30% of the total land area in the world, and approximately 54% of land that is suitable for growing crops in the world has acidic soil (Che et al., 2015). As a result of the low concentrations of nitrate in acid soils (pHwater < 5), in the beginning of the 20th century it was believed that nitrification did not occur in such soils (Noyes and Conner, 1919). In the middle of the 20th century, it became known that nitrification could take place in such soils and that low soil pH does not hinder the activities of nitrifying microorganisms (Robertson, 1982). Nevertheless, in acidified soils, the intensity of nitrification is lower than what is attainable in soils with higher pH values (Yao et al., 2011). A decrease in the availability of NH3 causes an exponential decrease in the pH of soil (De Boer and Kowalchuk, 2001). In addition, the fertility of acidic soils is low due to the existence of toxic metals and a shortage of nutrients, possibly influencing soil nitrifying microorganisms (AOB and AOA). Exceptions to this generalization do occur (Yao et al., 2011)which can be ascribed to the fact that acid tolerant nitrifying organisms can be active in both soils with high and low pH values, while those organisms that are not acid tolerant only function in soils with a higher pH. Several mechanisms by which the pH of soil affects the activity and growth of functional groups of microbes have been ascertained by a combination of physiological and microcosm studies of soil (Nicol et al., 2008, De Boer and Kowalchuk, 2001). The activities of nitrifying microorganisms can be restricted by the availability of a limited range of substrates and is a significant feature controlling heterotrophic nitrification (Zhang et al., 2014). There are two pathways by which the production of nitrate from ammonia occurs in soil, either through the action of chemoautotrophic nitrifiers or by heterotrophic nitrification, which is controlled by heterotrophic nitrifying bacteria or fungi (Zhang et al., 2013a, Zhang et al., 2013b). Depending on the availability of substrates in the soil, fungal nitrifiers have the ability to switch to other nitrification pathways (Aarnio and Martikainen, 1992). The contribution of heterotrophic nitrification can be determined by the C/N ratio of the N substrate. The possession of a high C/N ratio by organic N compounds, which intensifies the bioavailability of C, can stimulate the growth of heterotrophic bacteria, thereby resulting in the inhibition and displacement of nitrifying bacterial growth and the activity of autotrophic nitrifiers. Inhibition of microbial competition is a possible consequence of the production of by-products by fungal nitrifiers. Inorganic and organic substrates can be effectively used as sources of nitrification. Nitrogen compounds from different sources can function as substrates for heterotrophic nitrification. Organic nitrogen compounds have been utilized as substrates for heterotrophic nitrification in acidic soils (Zhang et al., 2014). Substrates in the soil are determinants of the vegetation that can be found in a particular area. The N-resorption efficiency of various types of vegetation is different and because of this, different plant groups have different concentrations of N and different C/N ratios. The plant population in a given locality influences the activities of microorganisms present in the soil and the cycling of nutrients (Bosco et al., 2015, Rumpel et al., 2015). The influence and availability of substrates on nitrification have been argued to be more important than pH. The addition of substrates in different treatments can cause noteworthy changes in the soil pH. For example, Zhang et al. (2014)reported significant changes in the pH of soil after the addition of substrates. Low concentrations of ammonium may curtail the growth of AOA or cause the N concentration of ecosystems to be low (Könneke et al., 2005). The demand for NH3 for microbial growth differs between AOA and AOB. The abundance of AOB declines with soil depth, while AOA shows little variation (Leininger et al., 2006). AOB growth is believed to be supported when soil conditions are fertile, whereas AOA have a preference for oligotrophic environments or those with low fertility (Erguder et al., 2009). AOB thrive under conditions of high NH3 availability, whereas AOA prefer low NH3 conditions (Di et al., 2010). The response of nitrification to the availability of NH4+ availability can be ascertained by Michaelis-Menten kinetics, and this model has been used to characterize some nitrifiers in soil (Stark and Firestone, 1996). Soil microorganisms are highly responsive to high temperatures. Microbial activity generally increases with increasing temperature over the typical ambient temperature range (Gilliam et al., 2015).The sensitivity of soil organic matter mineralization to temperature is affected by the type and availability of the substrate (von Lützow and Kögel-Knabner, 2009). Soil temperature can impact the quantity of nitrogen that is present in the soil for plant use and determines the fate of this nitrogen (Thangarajan et al., 2015). Temperature is a determinant of how biological processes that are involved in the transformation of nitrogen in soils function. Similar to all other microorganisms, nitrifiers respond to changes in temperature, and the rate of nitrification in the soil is greatly influenced by temperature. At soil temperatures lower than 10°C, the occurrence of ammonification instead of nitrification is greater (Emmer and Tietema, 1990). 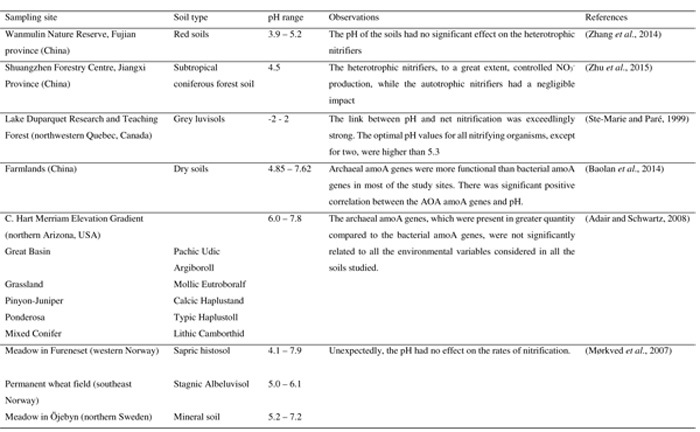 Due to the impact of different microbial communities on nitrification, the impact of temperature on the different soil horizons could be dissimilar (Schütt et al., 2014). The Arrhenius equation or the Q10 function can describe the rate of nitrogen mineralization in response to temperature (Kladivko and Keeney, 1987). The response of nitrification to temperature is correlated with climatic zones (Malhi and McGill, 1982). The climatic conditions in warmer regions support nitrification with an optimum temperature of 35°C, and the process still takes place at temperatures as high as 50 °C (Myers, 1975). Global patterns of the storage of soil nitrogen and the stability of soil organic matter may not be the only determining factors of how the mineralization of soil nitrogen responds to climatic change. The link between the recalcitrance of organic matter and the temperature response function could also be a factor (Post et al., 1985). Dalias et al. (2002)investigated the variation between soils in response to temperature of the net mineralization of nitrogen and nitrification. They reported that the regional climate determines the relationship between temperature and the oxidation of ammonia. Thangarajan et al. (2015)studied the influence of temperature on the transformation of nitrogen between organic and inorganic nitrogen sources. They reported that 2 4°C is the optimum temperature in all the soils studied except one. Their study demonstrated a link between the optimum temperature for nitrification and environmental conditions. Additionally, microcosm experiments by Tourna et al. (2008) demonstrated that the community structure of archaeal ammonia oxidizers heightened as the incubation temperatures increased. In high-latitude and altitude ecosystems, the processes of the cold season significantly contribute to the annual mineralization of nitrogen in the soil (Schütt et al., 2014). Although autotrophic nitrifying bacteria do not thrive at cold temperatures (Cookson et al., 2002), the microbial activity in the soil can give a satisfactory record of net nitrogen mineralization (30  50%) throughout the year since microorganisms remain physiologically active in unfrozen water films (Kielland et al., 2006). Using microbiological and molecular methods, Schadt et al. (2003) reported that the peak tundra soil microbial biomass occurs when it is under snow. Anabolism and catabolism have been shown to persist between -4 and +9 °C, and these processes may lead to an expansion of microbial nitrogen demand particularly in boreal soils (Drotz et al., 2010). At temperatures below 5 °C, the intensity of the activity of microorganisms in temperate soils may diminish (Pietikäinen et al., 2005). However, Schütt et al. (2014) reported the observation of gross nitrification at low temperatures (-4 - 8°C), suggesting that nitrifying microorganisms are functional at such temperatures. The optimum temperature for the nitrification activity of ammonia oxidizers has been reported by different studies, ranging from 20 - 37°C (Stark, 1996). Justice and Smith (1962)reported that the rate of nitrification at 25°C was higher than at 35°C. Ammonia is ubiquitous in nature and is a substrate used to produce nitrate. Ammonia-oxidizing bacteria and archaea are the primary players that participate in the conversion of ammonia to nitrates. Nitrate is the only form of nitrogen which can be utilized by most plants. Some factors, such as pH, availability of substrate, temperature, and moisture content, can hinder activity and determine the abundance of ammonia oxidizers. To obtain optimal plant yields and growth, these factors should be considered and optimized. Much remains to be discovered with regards to ammonia oxidizers. Cultivating different effective ammonia-oxidizers and the use of a consortium of such microbes to increase nitrate production is an area of research that should be actively studied. More effective ways to reduce the loss of nitrate from the soil should also be investigated. AEA would like to thank the North-West University for postgraduate bursary. This work is based on the research supported by the National Research Foundation of South Africa (Grants Ref: UID81192, UID105248, UID95111; OOB). Bosco, T., Bertiller, M.B., Carrera, A.L. 2015. Micro-environmental conditions affect grass and shrub seedling emergence in denuded areas of the arid Patagonian Monte, Argentina. Flora-Morphology, Distribution, Functional Ecology of Plants. 210, 66-71.